As part of the UK-Russia Year of Culture, business and culture missions from Russia’s second largest city have descended on London and Manchester for a series of high-profile events to proudly showcase its economic and cultural potential to British partners. It is no accident that St. Petersburg, of all Russian cities, has received so much attention during the UK-Russia Year of Culture. It is one of three Russian federal-status cities endowed with a whole range of functions that are normally the privilege of a capital city. 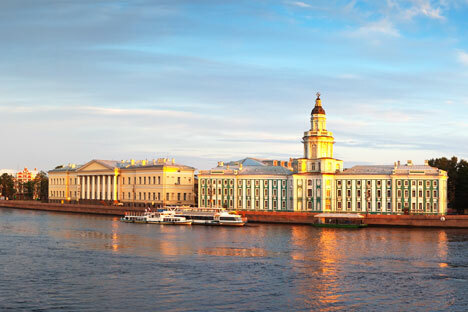 St. Petersburg is the second largest metropolis in Russia and third (behind Moscow and London) in Europe. Seen as the “Northern Capital’’ by Russians, St. Petersburg is home to five million people, 8,500 cultural heritage sites including more than 4,000 sites of federal importance, amounting to nearly 10pc of all protected monuments in Russia. With its historic city centre listed by Unesco as a World Heritage site, St. Petersburg ranks among Russia’s top 10 most popular tourist destinations. The city is world famous for its cultural institutions – the Mariinsky Theatre, the Hermitage and the Russian Museum. The city is a magnet for enthusiasts of live and contemporary arts, and is creating the infrastructure to promote them. Projects like the Tkachi creative space, Etazhi loft project, and Erarta contemporary art museum are especially popular with creative young people. These and other sites were promoted during the St. Petersburg… Take Another Look festival, staged as part of the city’s cultural and business mission to the UK in an attempt to show the city in a fresh light. Aimed at promoting trade and economic co-operation and know-how exchange, the business aspect of the programme involved the St. Petersburg delegation meeting with representatives of innovative British hi-tech and IT companies. These included a tour of Daresbury Park in Manchester and a visit to the Siemens innovation centre, The Crystal, in London. St. Petersburg ranks among the top three biggest innovation hubs in Russia and the top 100 innovation centres in the world (84th in the Australian ranking 2thinknow). Home to more than 320 research institutions and 90 colleges and universities, the city boasts vast human resources and intellectual potential. To promote innovation, the city authorities are creating special infrastructure, such as the Ingria and Crystal business incubators. The city is also one of the Russian pioneers in implementing cluster policy for encouraging manufacturing and industrial development, and has thriving automotive, pharmaceutical, radio electronics, shipbuilding and IT clusters. More than 730 major and mid-sized companies form the backbone of St. Petersburg’s manufacturing industry, including leading Russian firms. A further 22,000 small businesses are also involved in manufacturing. The UK is among the city’s top 10 biggest trade and economic partners. Last year trade between St. Petersburg and the UK totalled £1.5bn, making the UK the seventh biggest trade partner of the Northern Capital. City businesses have shipped £1.14bn worth of goods to the UK, or roughly 9pc of the city’s total exports. The Russian side mostly supplies machinery, equipment, components, and precious metals, which account for 64pc of all exports. Copper and value-added copper products and various minerals also make up a substantial share of exports. In 2013, British imports totalled £957m. St. Petersburg buys mostly vehicles, mechanical products and electrical equipment. Last year the city did business with 193 countries and had a foreign trade turnover of £35bn. The UK also ranks in the top 10 by volume of investments in St. Petersburg’s economy: last year British nationals invested £249m. Cumulative investments amounted to £1.18bn as of January 1, 2014. More than 150 British companies have a presence in Russia’s north-west. UK businesses have interests in virtually all sectors: legal and financial consulting, construction, pharmaceuticals, tourism and other areas. British firms are involved in the design and expansion of the new terminal at St. Petersburg’s Pulkovo 2 airport and project management of the construction of the Nevskaya Ratusha office and business centre. One recently completed major project is the Tensar plant producing geogrids that was launched in February 2014 by the Princess Royal and Georgy Poltavchenko, the city’s governor. Direct St. Petersburg-London flights launched by Transaero last month will help boost tourism, adding a second direct connection between the two cities. Previously, only British Airways provided a direct service. Additional hotels are also opening: the boutique Hotel Indigo, part of InterContinental Hotels Group, opened in March 2014. Seeking to ensure the systemic development of all sectors of the city’s economy and high living standards, following extensive public consultations and with the help of leading academics and experts, city officials adopted an Economic and Social Development strategy for St. Petersburg until 2030, more commonly known as the 2030 strategy. The strategy is expected to help significantly boost foreign investment in the city. Attractive perks are offered to businesses looking to invest in the region. These include a preferential land tax for businesses and tax breaks for information technology and travel companies. “The 2030 strategy of St. Petersburg systematises all methods and tools that the government uses to manage the economy, along with mechanisms for supporting emerging industries. From January 1, 2015, we will begin implementing the new strategy as part of the economic policy we have put in place,” Mr Poltavchenko told RBTH. As a result, by 2019 the share of hi-tech and scientific output of regional gross product in St. Petersburg is expected to increase to 20pc, while investment in fixed assets will go up by 70pc. Two well-established British groups – Sadler’s Wells and Wayne McGregor/Random Dance – will take part in the the Diaghilev PS Festival of Arts V in St. Petersburg. GRAD: Gallery for Russian Arts and Design will host an exhibition titled Bolt, about The Bolt ballet by Dmitri Shostakovich. The exhibition is organised in collaboration with St. Petersburg State Museum of Theatre and Music. Exhibits of the St. Petersburg State Museum of Theatre and Music Arts will be featured at the exhibition entitled Russian Avant-Garde Theatre: War, Revolution, and Design, 1913-1933, at the Victoria and Albert Museum in London. The state Hermitage Museum will display works by the prominent British artist Francis Bacon. Prepared in association with the St. Petersburg administration.